The Victoria's season came to an end with a 5-0 loss Thursday night to the Transcona Railer Express. The Victorias would like to thank their fans for all their support this season, their sponsors and honor three veteran players who graduated this year, Bryce Dusik, Riley Beauchemin and Jordan Ivanyshyn. Have a great , safe summer to you all and we look forward to seeing you again in September! Please check the web sight during the summer for any Victoria and MMJHL News . VICS WIN 3-1 , FORCING GAME SEVEN! The Victorias and Transcona Railers met in Game 6 of their MMJHL Quarter final Round Tuesday night at Ed Golding, East End Arena, with the Vics taking a 3-1 victory and forcing a game seven! As with the rest of this series, the game was very a close, tough game, with no scoring in the first period. Riley Beauchemin scored his second of the playoffs just 28 seconds into the second period, but the Railer Express didn't take long to answer, Nathan Hillis scored just 37 seconds later evening the score. Dylan Stockl scored an insurance goal at 11:11 and that was the final. Mason Swerdyliak made 36 saves for the Win, while Wyatt Emes stopped 30 Victoria shots . Kevin Todd, Charleswood Hawks Equipment Manager has elected to retire after 34 years in the MMJHL. Kevin has worked with the St. Boniface Riels, from 1985 to 1990, the River East Royal Knights from 1990-1995 and then the Charleswood Hawks from 1995- 2019. Always friendly and easy to talk to, Kevin would also help out whenever you asked. Congratulations Kevin on a long successful career in the league, and the Victoria's organization would like to wish you all the best in your future endeavours ! The Vics and Railer Express renewed hostilities Sunday afternoon , with Transcona taking a 3-2 series lead in the series , thanks to a 3-2 OT victory. The Vics opened a two goal lead on goals by Ben Coppinger and Tyson Last but the Railer Express came back to tie the score in the third taking us to OT. After the first OT period was scoreless, the Railer Express scored the game winner on a power play goal at 5:23 of the second OT. Everything is on the line this Tuesday, March 26th, when the Vics travel to Transcona to try to extend the series to the seventh game. Puck drops at 7:30 PM !! The Vics and Railer Express tangled in Game four Thursday night at Ed Golding ,East End Arena, with the Vics coming out of the short end of a 6-5 final. The Railer Express had period leads of 3-2 and 6-3, before the Vics mounted a comeback in the third, but in the end were a little short. The Victorias went 0-4 on the power play, while the Railer Express went 1-4 . The Series continues with Game 5 , this Sunday, March 24 at the St.Vital Arena, please note the Game time is 2:30 PM! Game Three of the MMJHL Quarter final series, was held at St. Vital Arena Wednesday night, and the Vic's took advantage of the home ice, downing the Transcona Railer Express 2-1. The Vics Jonah Cook opened the scoring for the Vic's , with his first of the playoffs at 13:15 of the first period, giving the Vics the lead after one period. Jason Kotchon scored for Transcona at 2:38 of the second, evening the score , which remained tied at the end of two. Early in the third, Vic's captain Riley Beauchemin scored the game winner at 3:56 . Interesting note, this series is very close, all three games so far have ended 2-1 . Transcona pressed hard for the equalizer, pulling goaltender Wyatt Emes, with 1:23 left in the game, but couldn't score. The "Boston Pizza , Player of the Game" for the Vics was Mikael Berard who tallied two assists , and for the Railer express it was Wyatt Emes who kept his team in it with several excellent saves. Its a quick turnaround for the teams, Game four is tomorrow, Thursday, March 21 at the Transcona Ed Golding ,East End Arena. Game time is 7:30 PM! The boys were in Transcona Sunday afternoon, for game two of the MMJHL Quarter final action against the Transcona Railer Express, coming away with a 2-1 victory. This evens the series at one game each and the Vics regain the home ice advantage in the series. Nik Kowalski opened the scoring for Transcona, at 9:31 of the first period , and the Vics Dylan Stockl replied for the Vics with a power play goal at 19:47 of the first period. There was no scoring in the second period, and in the third, Devin Bulloch scored what was the eventual game winner at 10:43 of the third. Mason Swerdyliak was sharp in the Vic's goal , stopping 44 shots , while Wyatt Emes made 25 saves for the Railer Express. Game 3 in the series goes Wed. night at St. Vital Arena, Game time is 7:30 PM. The Jr. Victorias opened their quarter-final series against the Transcona Railer Express, dropping the first game 2-1 Friday night at St. Vital Arena . The Railer Express opened the scoring at 3:44 into the first period, on a goal by Jason Kotchon, then increasing the lead to 2-0 at 8:22 of the second on a goal by Michael Laden. Tyson Last narrowed the lead to 2-1 at 12:47 of the second, but that was all the scoring , making it a 2-1 final. The "Boston Pizza, Player of the Game " for Transcona was Jason Kotchon, while the Vics Goaltender Mason Swerdyliak got the nod. VICS CLOSE OUT SEASON WITH VICTORY OVER RIELS, BEAUCHEMIN WINS SCORING TITLE! The St. Vital Victorias closed out the 2018/19 season with a 7-3 win over the St. Boniface Riels. but the real story this night was Vic's captain, Riley Beauchemin scoring five points , three goals and two assists to claim his third consecutive MMJHL scoring title! Beauchemin scored three goals ,his 40,41 & 42nd of the year , and added assists on Jonah Cook's 23rd of the year, and clinched the scoring title with an assist on Tyson Last's 18th of the year with just 12.1 seconds left in the Game. Troy Earl added two goals, his 8th and 9th of the season to round out the scoring . Reese Jones made 26 saves to claim the win for the Vics. in 1981/82,82/83 and 83/84 . The Victoria's organization would like to congratulate Riley on this achievement ! The Victorias will face the Transcona Railer Express in the first round of the MMJHL playoffs . The Vics were in Stonewall on Sunday Night , losing in a shootout to the Stonewall Jets 4-3. Vics goal scorers were Devin Bulloch, his 7th, Bryce Dusik's 6th and Jonah Cook's 22nd of the year . With the loss, the Victoria's will finish in fourth place with a 28-13-3 record. The Victorias were in Morris, Manitoba Friday night and lost to the PV Twisters 5-1. Pembina Valley lead 2-0 after one and 4-1 after two, the only Victoria goal scored by Jonah Cook, his 21st of the year on a power play. The Twisters outshot the Vics 46-34. St. Vital now travels to Stonewall on Sunday to take on the Stonewall Jets, and then return home to host the St. Boniface Riels on Tuesday , closing out the regular season . The Vics were in Charleswood Sunday night to close the regular season series against the Charleswood Hawks, downing them 5-4. The boys took a 2-0 lead after one on goals by Troy Brown, his 15th, and Devin Bulloch, his 6th . Charleswood came back in the second, with Quinn Werbowski scoring just 1:32 into the period. The Hawks then followed that up with two quick goals by Matt Lawrence at 17:53 and Taylor Opperman at 19:14 giving the Hawks a 3-2 lead after two periods. In the third period, Troy Earl evened the score with his 7th of the season, but the determined Hawks took the lead back on a goal by Sean Robinson. The Vics Bryce Dusik evened the score at four with his 5th of the year as 12:11 and then Captain Riley Beauchemin scored the game winner with his 39th of the year with just 1:49 left in the third. Charleswood pulled goaltender Ryan Hall to try to get the equalizer, but came up short , the Vics came away with a 5-4 victory. Hall made 40 saves for the Hawks, while the Vic's Reese Jones stopped 36 shots taking the W .
The St. Vital Victorias came back to defeat the Transcona Railer Express 5-4. at St. Vital Arena , Thursday Night . Transcona jumped out to a 2-0 lead in the first period, on goals by Jason Kotchon and Nik Kowalski. The Vics stormed back tying the game on goals from Mikael Berard and Troy Brown , just eight seconds apart. The Railer Express re took the lead in the second on a goal by Devon Matsumoto , but Tyson Last scored at 8:52 and the second period ended in a 3-3 tie. Kelby Picard gave Transcona the lead yet again at 2:30 of the third, then Tyson Last scored his second of the night tying the score again. Just when it looked like OT was in the cards, the Vics Dylan Stockl jumped on a puck the Transcona goaltender Wyatt Emes couldn't control the rebound on, giving the Vics their first lead of the game with just 2:23 left in the third. Mason Swerdyliak recorded the win stopping 28 shots, while the Railer Express Wyatt Emes also stopped 28 shots taking the loss. The "Boston Pizza , Player of the Game " for the Vics was Tyson Last , who scored twice, and for the Railer Express it was Nathan Hillis , who had two assists . The St. Vital Victoria's Major Junior Hockey Club is pleased to announce details and release tickets for their 5th annual Sports Banquet. As the primary fundraiser for the club, the event aims to link inspirational speakers relevant to our organization , and an exciting , memorable evening jam packed with entertainment . To ensure you have some great laughs , Canadian comedian and entertainer Dave Hemstad will headline the evening and returning as the host is Power 97's Phil "Philly" Aubrey . Tables of 8 and 10 are available at $1,200 and $1,500 . The St. Vital Victoria's won their second in a row Sunday night at the St.Vital Arena , downing the Raiders Jr. Hockey Club 2-0. The Victorias rode the goaltending of Mason Swerdyliak, who recorded his second shutout in a row, stopping 36 Raider shots , and Captain Riley Beauchemin, who scored both goals , his 37th and 38th of the season. The "Boston Pizza, Player of the Game " for both teams were the goaltenders on this night. The Vic's Mason Swerdyliak stopped 36 shots for the win, while the Raiders Logan Thiessen stopped 25 Victoria shots ,taking the loss. Next up, the Victorias host the Transcona Railer Express , who are hot on the heels of the Vics in the MMJHL standings. The St. Vital Victorias were in St. James Friday night to take on the St. James Canucks , coming away with a 6-0 shutout win. St. Vital came out strong on goals by Kevin Lamb, his 8th, Riley Beauchemin's 36th,Tyson Last's 15th and Devin Bulloch's 5th, taking a 4-0 lead into the first intermission. The Vic's added to the lead in the second with Troy Earl's 6th and in the third, Liam Grossman scored his 1st making it a 6-0 final. Mason Swerdyliak made 30 saves for his 3rd shutout of the year, his record is now 15-5 . The Vics travelled to the Century Arena Sunday night and dropped a 7-5 decision the Twins. St. Vital lead 3-1 after one and 5-3 after the second, before the wheels came off in the third , when the Twins outscored the Vic's by four goals, making it a 7-5 final. The Victoria's are now in fourth place, and with seven games remaining, teams are jockeying for playoff positions! The Stonewall Jets came to the St. Vital Arena Thursday night and stopped the Victorias 7-4. Stonewall jumped out to a 4-0 lead after the first period, then Troy Brown scored his 12th of the year at 1:19 of the second, but 15 seconds later the Jets got that back and added another with 49 seconds left in the period , taking a commanding lead into the third period. The Vics made a mini comeback in the third, with Bryce Dusik scoring his 4th of the year, Reese Ketler's 3rd and Devin Bulloch's 4th. The Jets added another ,and it was a 7-4 final. The "Boston Pizza, Player of the Game " for the Jets was Ryan McMahon, and for the Vics it was Devin Bulloch. The Jr. Victoria's travelled to Morris Mb. Friday night to tangle with the League leading Pembina Valley Twisters , coming away with a 6-5 victory in a shootout. The Vics lead 2-0 after the first period on goals by Devin Vercaigne, his 4th, and Tyson Last, his 13th. 's two goal lead at 12:25The goals came fast and furious in the second , with four goals scored in a span of 3:22 . First Elijah Carels cut the Vic's lead ,scoring at 11:28, Then Jonah Cook restored the Vics lead scoring his 19th at 12:25. That two goal lead was short lived as the Twisters Jeremie Goderis scored at 12:41 and then again at 13:58. Carels added his second of the night at 14:50 and the Twisters took a 4-3 lead into the second intermission. The Twisters extended their lead when Sven Schefer scored at 4:02, making it 5-3. At 10:27 , the Vics Kevin Lamb scored his 6th of the season, and Ben Coppinger tied the score at five at 13:34 . Overtime didn't settle anything, and the teams were off to a shootout, with the Victoria's Troy Brown scoring the winner , making it a 6-5 final. Mason Swerdyliak made 37 saves to record his second win in two nights, his record is now 14-4. The Victorias downed the St. Boniface Riels Thursday night at the St. Vital Arena 7-2 on the strength of Captain Riley Beauchimin's 6 point night , 2 goals and four assists . Jonah Cook added four points , two goals and two assists , while Reese Ketler, Troy Brown and Mikael Berard added singles. Kyle Lang and Jacob Tresoor replied for the Victorias. Mason Swerdyliak stopped 30 Riel drives to claim the win, while the Riels combo of Matt Merkel and Tyler Gagliardi stopped 33 shots. The "Boston Pizza, Player of the Game" for the Vics was Riley Beauchemin with his six point night, while Jacob Tresoor was the Riels pick, scoring a goal and assisting on the other . The Victorias were lead by Troy Brown's hat trick, Rile Beauchemin and Tyson Last both added two goals , and Bryce Dusik added a single. For the Royal Knights Ethan Hunter had a pair of goals , with singles by Riley Hall,Tanner Chamberlin,Brayden Sul, and Ryden Fedyck. The Vics lead 2-1 after one, and the teams were tied at six after a wild second, which saw the Royal Knights score three Power Play goals in a span of 2:39. The "Boston Pizza , Player of the Game " for the Vics was Troy Brown, who had three goals and added two assists. The Knight's Etnan Hunter got the nod, scoring two goals on the night. The Vics next host the St. Boniface Riels , Thursday night at St. Vital Arena. puck drop is 7:30 PM. The Raiders opened the scoring on Jayce Kennedy's goal at the 4:59 mark of the first , but the Vic's Troy Brown evened the score with his 7th of the year on the power play just 1:47 later . Milan Horanski gave the Raiders the lead back at 18:46 of the second , and then added the insurance marker at 17:17 of the third, making it a 3-1 final . The Raiders outshot the Vics 31 to 22. The Vic's now have a little time off, they next have a date with the River East Royal Knights on Tuesday, Feb 5th at the St. Vital Arena. Game time is 7:30 PM . The Victorias hosted the always tough Charleswood Hawks Thursday Night at St. Vital Arena, coming away with a 3-2 victory. The Hawks, opened the scoring at 7:53 on a goal by Max Gardner, and the Hawks took that lead into the first intermission. However, the Hawks ran into penalty problems late in the first period, and found themselves two men short with just 17 seconds left in the first period. The Vics took full advantage ,scoring two power play goals early in the second period, Devin Bulloch, his 3rd of the year , at the 50 second mark, then Troy Brown, his 6th of the year at the 1:20 mark. Charleswood evened the score on a goal by Sam Maxwell at 7:01 , but the Victoria's Bryce Dusik scored what proved to be the winner at 18:03 of the second. The third period was scoreless, making it the 3-2 final. Mason Swerdyliak gets the win , stopping 31 shots, while the Hawks' Ryan Hall stopped 27 shots. The "Boston Pizza, Player of the game for the Victorias was Devan Vercaigne, while the Hawks Sam Maxwell, scring his first MMJHL Goal, got the nod . This weekend the MMJHL held their showcase weekend at the MTS Ice Plex in Headingly, and the Vics took two victories in the games they played. The Railer Express got off to a good start taking a 2-0 lead into the first intermission, on goals by Kelby Picard and Devon Matsumoto. Devin Bulloch got the Vic's on the scoreboard, with his second of the year, just 34 seconds into the second and Jonah Cook tied the score at 16:13 and it was tied at two, after two. The third was all Vics as Tyson Last scored his 10th, Ben Coppinger , his 13th and Riley Beauchemin his 31st into an empty net to round out the scoring. Mason Swerdyliak claimed the W , his record is now 10-3-2. Sunday afternoon, the boys tangled with the River East Royal Knights, scoring a 4-0 victory. For the boxscore, please click the link https://www.mmjhl.ca/box.php?game_id=3590. Goal scorers for the Vics were Ben Coppinger, his 14th, Mikael Berard, his 8th, on a power play, Kevin Lamb, his 5th, short handed, and Troy Earl his 5th, on another power play. The Vic's hosted the St. James Canucks ,Thursday at St. Vital Arena , scoring a wild 7-6 OT Victory. The Vics did open the scoring with Jonah Cook ' 14th of the year at 3:46 . The Canucks replied with a power play marker at 7:02 by Tristan Ezako. St. James took the lead at 10:30 of the first, another PP goal by Cole Chicoine, but the Vics Troy Earl scored his 4th of the year , tying the score at two. Just 32 seconds later the Canucks re took the lead on Curtis Rebeck's goal and the Canucks took that 3-2 lead into the first intermission. In the second the Canucks blew it open, scoring three more goals, Ezako's second of the night, yet another PP goal, Chicoine's second of the night and Dylan Burton's goal gave them a 6-2 lead after two. The Canuck's power Play was deadly, going 3 for 3 on the night. While it looked like the third period would just be a formality, the Vics stormed back with Jonah Cook scoring his second of the night just 39 seconds into the third, Ben Coppinger 's 12th of the year at 6:33, Mikael Berard's 7th of the year and Riley Beauchemin tying the game at 17:31 with his 30th of the year. The game went to OT and newcomer Devin Bulloch notched his first of the year at 2:11 of the OT. Reese Jones stopped 30 shots for the W, while Nathan Cvar stopped 26 Victoria drives and is credited with a tie . The "Boston Pizza, Player of the Game " for the Victorias is Troy Earl who scored a goal and an assist, and had a solid game defensively. For the Canucks it was John McCammon who logged three assists for the Canucks. The Vics hosted the Fort Garry Twins Thursday night , downing the Twins 5-4 in OT. Fort Garry started out fast ,taking a 3-0 lead into the first intermission on two goals by Brandon Marques and a single by Jack Cowell. In the second , the Vics came around scoring three goals in a 4 minutes and 16 seconds span. Jordan Ivanyshyn , scoring his second of the year, and Jonah Cook with a pair, his 11th and 12th of the year. The Twins weren't finished , retaking the lead at 3:21 on a goal by Tyler Slobogian. Then at 8:36 , Troy Brown scored his 5th of the year, which took us to OT. Overtime was short as Jonah Cook scored his 13th of the year just 32 seconds into the period, giving the Vics the W.
The "Boston Pizza , Player of the Game for the Vics was Ben Coppinger, who contributed three assists and was a team leader for the boys this night. The Twins BPPOTG was Brandon Marques who scored two goals . Reese Jones made 38 saves claiming the Win, while Zak Bannatyne stopped 32 shots , and is credited with a Tie. Sunday night , there was more than a snowstorm in St. Vital, there was a full blown Twister, as in Pembina Valley Twisters blowing through St. Vital. The Twisters dominated the Vics to a tune of 7-1. There isn't much that can be said, other than time to move on to prepare for the next game, this Thursday ,when they host the Fort Garry Twins. Game Time is 7:30 PM. The "Boston Pizza, Player of the Game " for the Twisters was Sven Schefer , who scored 1 goal and had 3 assists . For the Vics , it was Jonah Cook, who scored his 10th of the year. It wasn't the start the Vics were looking for, the Railer Express scored two quick goals by Noah Skorpad and Nik Kowalski, giving them a 2-0 lead just 2:31 into the game . The Vics, however, fought back tying the game before the end of the first period on Mikael Berard's 6th and Dylan Stockl's 12th, which was a PP goal. The Railer Express regained the lead on a power play goal by Joel Delorme, but the Vic's had an answer , a power play goal by Ben Coppinger, his 10th at 19:43. The Third period was all Victoria's as Riley Beauchemin scored his 28th and 29th of the year, and Coppinger adding an empty net goal , his 11th of the year, making it a 6-3 final. Mason Swerdyliak made 31 saves to claim the Win, his record is now 9-3. The Vics were lead by Nico Labossiere, who recorded a four assist night. Ben Coppinger had two goals, his 8th and 9th of the season, with singles going to Tyson Last, his 9th, Dylan Stockl, his 11th, Mikael Berard's 4th and Kevin Lamb's 5th. Reese Jones stopped 30 shots to record the Win, his record now stands at 7-5-2 for the season. Nicolas Burmey and Kyle Morton replied for the Riels. Next up, The Vics take on the Transcona Railer Express this Friday at the Ed Golding (East End Arena ) puck drops at 8:00PM. VICTORIA'S ANNUAL CHRISTMAS HAMPER DRIVE HAS ANOTHER SUCCESSFUL YEAR!! Thanks to the generous support of the St. Vital Victoria fans , parents, players coaches and board members, five families received Christmas turkey Dinner fixings as well as a box of oranges, candy, and boxes of food to help them through the holiday season. The players were delivering the hampers and did themselves and the Victoria organization proud with their turnout, their enthusiasm, and the pride the guys showed for their team, but more importantly, the respect they showed for the families. The parents ,coaching staff and the St. Vital Victoria Board is very proud of our team! Special thanks to Mrs. Angela Torgerson , for coordinating the Hamper Drive! The Victorias would also like to take the opportunity to wish everyone a very Merry Christmas , Season Greetings and all the best for 2019! St. James took control early, building a 5-0 lead in the second period, before Tyson Last scored his 8th of the season at 13:17 of the second. Riley Beauchemin also scored for the Vics, his 27th of the year. St. James outshot the Vic's 39-26. Just after the midway point of the season, the Victorias are 14-8-2 for 30 points and tied for fourth place , with the Transcona Railer Express. The Vics do have three games in hand over the Railer Express. Still lots of hockey to play! The St. Vital Victorias visited the Eric Coy Arena Friday Night coming away with a 2-1 come from behind victory. Joben Smith opened the scoring at 17:08 of the first , giving the Hawks a lead that lasted into the third period. Vic's Captain Riley Beauchemin scored to even the score with his 26th goal of the season at 4:57 of the third. Tyson Last scored the eventual winner at 14:25 with his 7th of the season. Reese Jones recorded the win for the Vic's stopping 31 shots, while the Hawks Ryan Hall made 35 saves, taking the loss. Jones' record this year is now 6-5-2. The Raiders Nolan Wisniewski opened the scoring on a power play with just six seconds left in the opening period. The Raiders took that lead into the intermission and then after a scoreless second period, Vics Captain Riley Beauchemin tied the game with 2:45 left in the third , so it was off to overtime. Nico Labossiere in his first game as a Victoria, was the hero scoring 38 seconds into the OT on a setup from Ben Coppinger. The Victorias Mason Swerdyliak claimed the Win stopping 40 shots, improving his record to 8-2. Logan Thiessen stopped 22 shots. The Jr. Victorias closed out the home portion of 2018 with a 4-0 shutout over the Stonewall Jets. The Vics were lead by Riley Beauchemin, Jonah Cook, Dylan Stockl and Mikael Berard, leading 1-0 after one and 4-0 after the second. Reese Jones earned the shutout, making 39 saves. Adam Swan made 22 saves for the Jets. The two goaltenders were also the "Boston Pizza ,Player of the Game " for their play. The Vics finish out the 2018 portion of the schedule by travelling to the Seven Oaks Sports plex to take on the Raiders JHC, this Sunday, Game time is 2:30 PM. The then play Charleswood Hawks on Friday, Dec. 21 and then finally the St. James Canucks on Sunday, Dec 23 . The Vics were at home on Sunday night ,hosting the Pembina Valley Twisters, coming away with a 7-6 OT victory in a shootout. St. Vital lead 4-2 after one period, but the Twisters roared back with their league leading power play, scoring two power play goals in the second ,tying the game after two at four. They then added another power play goal and an even strength goal, taking a two goal lead, however the boys fought back, scoring two goals in 32 seconds evening the score at six. The third ended tied and it was off to a five minute OT period, where Sam Krushel was the hero beating Twister goaltender Travis Klassen. Mason Swerdyliak was the winning goaltender making 39 saves, while the Twisters combo of Martin Gagnon and Travis Klassen stopped 34 shots. The "Boston Pizza , Player of the Game for the Vics was Sam Krushel, scoring two goals , including the winner, while Jeremie Goderis was the Twisters selction scoring a goal and an assist. Next up, the Vics host the Stonewall Jets Thursday night, Game Time is 7:30 PM. Thursday is the Vics last home game before the Christmas break, and the last game thy will collecting for the Christmas Hamper! VICTORIAS KICK OFF CHRISTMAS HAMPER DRIVE!!!! It's December again, and the St. Vital Jr. Victorias are again collecting for their annual Christmas Hamper Drive . The team will be accepting gifts of both perishable and non- perishable foods and cash donations during their home games on Sunday, Dec. 9th and Thursday , Dec 13. All collected will go to local families that could use a helping hand , especially during the holiday season. The Victoria players ,staff and executive thank you for all your support , and wish everyone a Merry Christmas and a Happy Holiday Season! The Vics were at home Thursday Night to take on the St. Boniface Riels , edging them 4-3. Scoring for the Vics was Derek Cook, with his first MMJHL goal, Ben Coppinger , his 7th of the year Dylan Stockl with his 7th and Jonah Cook who scored his 8th with the eventual game winner. Replying for the Riels was Samuel Jean-Paul, Ben Kirton and Nicolas Burmey. Mason Swerdyliak stopped 30 shots for the Win, while Tyler Gagliardi stopped 26 shots for the Riels. The "Boston Pizza, Player of the Game for the Vics was Riley Beauchemin, who had two assists, while Ben Kirton with a goal got the nod for the Riels. Next up, the Vics host the Pembina Valley Twisters Sunday, Dec. 9. Game Time is 7:30 PM. After taking a 1-0 lead on Dylan Stockl's 6th of the year, the Twins roared back taking a 3-1 lead on goals by Brandon Marques in the first, then Cole Doherty and Tyler Slobogian in the second , taking a 3-1 lead into the third period. Riley Beauchemin scored his 22nd of the year on a power play, and then Troy Earl tied the game with his 3rd of the year with just 37 seconds left in the game. The five minute OT didn't settle anything, so a shootout was required. It went to the sixth round, when the Twins Cole Zadro put one behind Reese Jones , giving the Twins the win. Other goal scorers for the Vics were Tyson Last with his 6th of the year and Dylan Torgerson , who scored his first into an empty net . Replying for the Royal Knights was Austin Thorarinson, Brayden Sul and Danny Harris . Mason Swerdyliak took the W with a 40 save night. Evan Baty took the loss stopping 44 Victoria drives. The boys opened the scoring on Derek Mathez's first of the year at 4:47 and took that 1-0 lead into the second. Dylan Stockl extended the lead to 2-0 with his 5th of the year at 11:37 of the second and the boys lead 2-0 after two periods . Transcona came out in the third , firing on all cylinders and scored four unanswered goals by Kelby Picard, Michael Laden and Noah Skorpad, who scored two goals, making it a 4-2 final. Reese Jones took the loss making 33 saves and the Railer Express' Wyatt Emes took the W making 36 saves. The Vics travelled to the Seven Oaks Sportsplex Friday night to take on the league leading Raiders, going home with a 5-0 victory. After a scoreless first period, Jordan Ivanyshyn opened the scoring at 7:17 of the second, with his first of the year. Kevin Lamb scored his third of the year, making it 2-0 with just 36 seconds remaining in the second, but the Vics weren't finished , Dylan Stockl potted his fourth of the year just 12 seconds later and the Victoria's took that 3-0 lead into the third. Riley Beauchemin added two goals in the third , his 17th and 18th ,making it a 5-0 final. Mason Swerdyliak made 28 saves to record his second shutout of the season, and improving his record to 4-2. Jeremy Pikel took the loss, stopping 29 shots . Next up, the Vic's travel to Transcona for a matinee encounter with the Railer Express on Sunday, Game time is 12:45 at the Ed Golding, East End Arena. Things did not start well for the Vic's as the Hawks jumped out to a 2-0 lead on goals by Kyle Nanton and Cam Petras. The Victorias were able to tie the score by the end of the first on goals by Riley Beauchemin and Ben Coppinger . Beauchemin scored the eventual winner at 8:29 of the second and Coppinger scored on a power play at 1:08 of the third. The "Boston Pizza, Player of the Game" for the Vic's was Ben Coppinger and for the Hawks it was goaltender Ryan Hall , who made 33 saves, many of the difficult variety to keep the Hawks in the game . No rest for the boys, they are on the road tonight, taking on the league leading Raiders JHC. The St. James Canucks were the visitors at the old barn on St. Anne's Rd. Thursday night, and edged the Vic's 4-2. The Canucks John McCammon opened the scoring at 13:50 of the first period, the only goal of the first. 4:06 into the second Ben Coppinger evened the score, but the Canucks took the lead again at 10:04 on a goal by Justin MacKinnon, a lead that St. James carried into the second intermission. Jonah Cook evened the score again at 7:22 when he batted a waist high puck past Canuck goaltender Nathan Cvar. The tie was short lived however, as the Canucks Cole Chicoine scored the eventual winner at 8:03. Jeremy Idzikowski added an empty net goal at 19:06 to complete the scoring. The "Boston Pizza , Player of the Game" for the Canucks was Cole Chicoine, who scored the winning goal and assisted on the empty net goal. The Vics BPPTG was Jonah Cook who scored the Vic's second goal. VIC'S RILEY BEAUCHEMIN NAMED MMJHL "PLAYALL AWARDS MMJHL PLAYER OF THE MONTH" FOR OCT 2018. The Victoria's Riley Beauchemin was named the MMJHL "player of the Month " for October 2018. Riley played 8 games, scoring 12 goals and 6 assists for 18 points, an average of 2.25 points per game . After a scoreless first period, The Victoria's opened the scoring with Tyson Last's fifth goal of the year, taking that lead into the third. The Twins Zach Odwak tied the score at 13:52 of the second on a power play goal, but Troy Brown gave the Vics their lead back just 1:18 later scoring his 4th of the year. With goaltender Zak Bannatyne on the bench for a sixth attacker, the Twins Cole Zadro evened the score putting the puck past Vic's goaltender Mason Swerdyliak with 39 seconds left in regulation time. Jonah Cook scored the winner at 4:08 of the overtime period, giving the Vics the victory. The "Boston Pizza ,Player of the Game" for both teams were the starting goaltenders , the Vics Mason Swerdyliak and the Twins Zak Bannatyne . Both were outstanding, and are well deserving of the award. This Sunday , the world will stop to honour and thank our veterans for their service and sacrifice. Today, we enjoy the freedoms and opportunities that we do, because of the sacrifice made by the men and women in uniform. So this Sunday the St. Vital Victorias ask you to please take a moment to remember, and thank the people that made the supreme sacrifice. The Jr. Victorias traveled to Stonewall , Mb. on Friday night ,coming out on the short end of a 5-1 score. The Jets goal scorers were Carson Ouelette,Aiken Chop, Ryan McMahon, Sam Mandryk and Jared Hulme. Replying for the Vics was Riley Beauchemin with his 14th of the season. The Jr. Vics were at the MTS Ice Plex Sunday Night to take on the St. Boniface Riels, losing 6-2. Ben Coppinger scored twice in the first period, his second and third goals of the season, giving the Vics a 2-0 lead after one. St. Boniface replied in the second with two goals by Brandon Bartley and Brayden Bazinet , evening the score after two periods. Reese Jones stopped 30 shots taking the loss while the Riels Tyler Gagliardi made 15 saves. The Pembina Valley Twisters blew into town Thursday Night to take on the Victorias and came away with a 6-5 victory. The Twisters lead 2-1 after one and then 4-1 after two. The Storm were about to make a laugher of the night, making it 5-1 in the third , when the Victoria's came storming back to make it 5-4 , the Twisters scored to make it 6-4, but the Vics were not giving up, making it 6-5. with 9:58 left. It came down to the wire, the Victorias even hit a goal post with 10 seconds left, but were not able to get the equalizer. JR. VICS SHOW THEIR HALLOWEEN SPIRIT!! 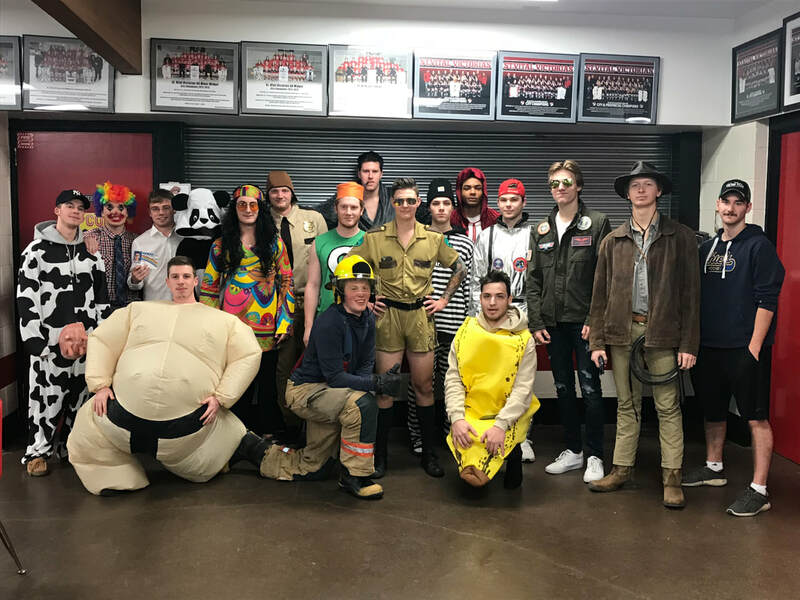 The boys came to their Wed night practice dressed for Halloween in costume. Sunday night the Vics took on the St. James Canucks at the Civic Centre , losing 4-2. The Canucks Wyatt Kemball opened the scoring at 12:09 of the first, the only goal of the first period. Jeremy Idzakowski made it 2-0 for the home team at 6:45 of the second, before Riley Beauchemin scored his 12th of the season, a power play goal at 14:44 of the second. Idzikowski gave the Canucks their two goal lead back just 27 seconds into the third, making it 3-1. Jeremy Cook scored another power play marker for the Vics , his 5th of the year at 8:47, bringing the Vics back to a one goal deficit, but John McCammon scored an empty net goal for the Canucks at 18:34 making it a 4-2 final. Next up, the Victorias host the Pembina Valley Twisters Thursday night . Game time is 7:30 pm. The Victorias took on the Transcona Railer Express Thursday night and stopped them in their tracks 8-3. Devan Vercaigne and Riley Beauchemin lead the Vics with three goal performances while Troy Brown and Troy Earl each added singles. Logan Waskul, Kelby Pickard and Noah Skorpad replied for the Railer Express. The Vics Reece Jones stopped 26 shots for the Win, while the Railer Express' Wyatt Emes and Eric Johnson combined to make 29 saves. Tyson Last opened the scoring for the Vic's with his 4th of the year at 14:44 of the first period and the Vics took that 1-0 lead into the first intermission. Ben Coppinger scored his first of the season extending the lead to 2-0 at 2:11 of the second, but the Royal Knights had some answers as they stormed bck with three goals by Jett Sielke-Bullard, Ethan Hunter and Danny Harris , Harris' goal came with just 19 seconds left in the period giving the Royal Knights a 3-2 lead into the second intermission. The see -saw game continued as Riley Beauchemin scored his 7th of the season at 3:51 of the third , tying the game and it remained that way until Justin Engel scored at 18:44 , giving the lead back to the Victorias. Beauchemin scored his second of the night, into an empty net at 19:07, and you would think that it was over, but the Royal Knights again came roaring back, Logan Bedard scored with 30 seconds left in the third, and then Tanner Chamberlin scored with 2 seconds left, tying the game. The overtime was scoreless with the Royal Knights outshooting the Vic's 7-5 in OT, so a shootout was required. It took seven rounds in the shootout, before Troy Brown finally scored, giving the boys the W.
The Victoria's hosted the Raiders JHC Thursday at the old Barn, coming out on the wrong end of a 7-3 score. The "Boston Pizza , Player of the Game" for the Victorias was Dylan Stockl, who scored two goals, and for the Raiders it was Kale Ilchena , who scored two goals for the Raiders. The Vics dropped their first of the season Sunday Night at St. Vital Arena , dropping a 5-4 OT decision to the Charleswood Hawks. The Victoria goaltenders, Mason Swerdyliak and Reese Jones combined to make 26 saves, with Jones taking the loss. Ryan Hall stood tall in the Hawks goal, stopping 40 Victoria shots, including seven in the OT period. Next up, the Vics host the defending MMJHL Champions , Raiders JHC, on Thursday. Game time ,7:30 PM. The Jets opened the scoring at 13:25 of the first period on a goal by Branden Groot, but the Vics evened the score just 1:49 later on Tyson Last's first of the year . With the teams ties at one after one, Last scored is second of the night at 16:11 giving the Vics a 2-1 lead that they carried into the second intermission. Riley Beauchemin extended the lead to 3-1 at 13:46 of the third, but the Jets were not going to give up, scoring two goals in 21 seconds by Jared Hulme and Chance Dickenson tying the score at three. The teams went to overtime, which solved nothing , so a shootout was in the works. The only shooter to register a goal was the Vics Ben Coppinger , giving the boys the OT win. The Vics Reese Jones was outstanding in the Vics goal, making 50 saves including 6 in the OT and stopping the Jets in the shootout. The Jr.Vics were lead by Jonah Cook and his five point performance (2 goals 3 assists) in defeating the River East Royal Knights Thursday at the St. Vital Arena coming away with a 8-0 win. Other Vic point getters were Riley Beauchemin 2G 2A , Mikael Berard 1G 2A, Derek Mathez 3A, Kevin Lamb 1G 1A, Dylan Stockl 1G 1A , Troy Brown 1G , Justin Engle ,Tyson Last and Derek Cook each had 1A. Mason Swerdyliak stopped 18 shots for the W and the shutout , while the Royal Knights Landen Miele stopped 37 Victoria drives . The "Boston Pizza Player of the Game" for the Vics was Jonah Cook with his 5 point performance , while Knights Goaltender Landen Miele was the Royal Knights player of the game stopping 37 shots. The Vics opened the regular season by visiting the Century Arena Sunday night to take on the Fort Garry Twins, coming away with a comeback 4-3 victory. To see the boxscore, please click the link. https://www.mmjhl.ca/box.php?game_id=3440. After a scoreless first period, the Twins opened the scoring on a goal by Brandon Marques at 15:44. The Vics evened the score at 17:43 on a marker by Mikael Berard, and it was 1-1 after two periods. In the third the Twins opened up a two goal lead on goals by Sean Lett, just 54 seconds into the period, then Zack Odwack at 11:54. The Victorias Riley Beauchemin answered with two goals at 13:58 and then tying the game 18:24 . The Victorias rookie Reese Jones stopped 52 shots , backstopping the Vics and claiming the W in his first MMJHL game. Zac Bannatyne stopped 45 shots taking the loss for the Twins. The St. Vital Victoria’s of the MMJHL have reserved ice on Tuesday August 21st and Thursday August 23rd from 9:45 – 11:15 p.m, at the St. Vital Arena , for players to skate prior to going to their respective High School, Junior A and MMJHL camps. We are hoping all returning veterans and many prospective St. Vital Vics will attend and use this opportunity to work on their pre-season conditioning as well as showcase their talents for new head coach Jeff Mitchell. Coach Mitchell would like to arrange individual meeting with the returning players and likely some prospects on these same two nights. Understandably we will have to limit the number of skaters and therefore would like you to RSVP myself or Jeff of your intention to attend at the numbers below by Sunday August 19th at 7:00 p.m. There is no fee to attend the open ice sessions. The St. Vital Junior Victorias are excited to announce that Jeff Mitchell has accepted the position of Head Coach for the 2018/19 season . Jeff brings a variety of coaching experience , having previously coached the AAA Bantam Warriors Provincial Midget Winnipeg Wild and Winnipeg Bruins, and also three years as an Assistant Coach with the MJHL Selkirk Steelers.
" I am very honored to be a part of the St. Vital Victorias program for the upcoming 2018/19 season.